Get out your iPad! The zombies are coming! So it's just another typical day in suburbia – the sun is shining, your neatly mowed lawn is a resplendent shade of green, and hordes of zombies are about to invade your home. Wait, run that last bit by us again? This is, in fact, a typical day in suburbia as put through the slightly deranged PopCap Games filter. Therefore, instead of pruning your shrubs, you must think fast and place plants with special powers on your grid-like lawn (and, later, roof) to combat the undead. 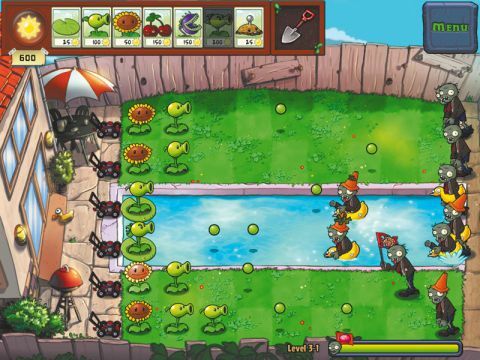 Plants vs Zombies is a new twist on the classic tower-defence genre. Essentially, the zombies attack (slowly) and you have to stop them by laying plants in their path. Before you can plant anything though, you need energy. You get this from suns that descend from the sky or are generated by the handy sunflowers you plant. The more energy you have, the more deadly varieties of plants you can grow. The little horrors can fire seeds or present traps to foil the lumbering zombies, who swarm in ever-increasing waves towards you. As levels progress, new and interesting plants and zombies are added to the mix, as well as more challenging environments. As you might have gathered by now, this game doesn't take itself entirely seriously – zombies send you hand-scrawled notes and come in many varieties, one of which happens to moonwalk while a spotlight shines on him. There's no doubt the humour and stunning graphics are what draw you in, but it's the gameplay that grips you, cunningly revealing new features and occasional mini-games throughout its 50 levels. It's testament to the quality of this towerdefence game that while we're thoroughly sick of the genre (what with the billions of examples out for iPhone), Plants vs Zombies HD has nonetheless managed to become our favourite iPad game.